Our friends, the Horsleys, deliver fruit from a number of small farms in the Lower Yakima Valley straight to Washingtonians within a day or two of being picked from the tree! We helped them with their look and to expand into the Seattle market after great success in Spokane. You've not had fruit till you've had right from the orchard fruit; we're believers! The Horsleys are a wonderful people. It was easy to see their success was a testament to who they are as people. Throughout we took great pains to stay true to what we were making was as effective at expressing the pure and friendly nature that is obvious when meeting Josh and Marisa in person. What resulted is a whimsical hybrid "fruit" that's indistiguishable as a single fruit but identifiable as a mark. "This design will leave a lasting impression, as if your product wasn’t going to. And second, it feels like Follow the Harvest." It was immediately obvious the reason the Horsley's where successful selling fruit was how easy it was to trust them. They are easy to talk to, humble and they have know how to make your mouth water. Our task was to replicate as best we could their personality through their web presence in their newly developed family-friendly brand. Selling a long term, premium product up front with no "demo" is a hard sell. We are ecstatic that in year two they have had another large increase in customers – we'd like to think we helped with that! What's wonderful about FTH's fruit is that everyone wants to share. We incorporated social sharing incentives built into the ecommerce as well as a new auto-debit Payment Plan that one-third of 2014's customers took advantage of! FTH already had a small fleet of large vans. We saw it important to carry across the playful and friendly aesthetic. 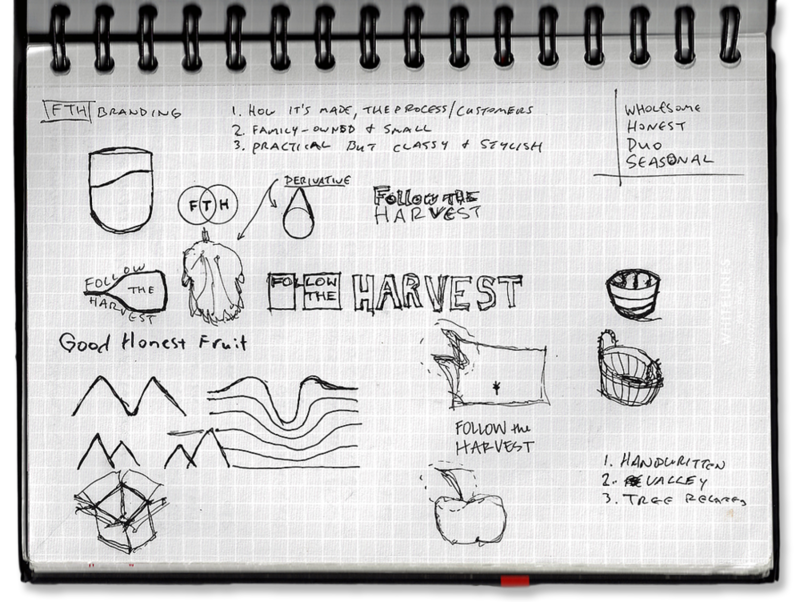 We used the "lineup" of illustrated fruit on the website and led by the logo. If anything emotes Follow the Harvest, it's this playful illustrated fruit! An oversized logo on the driver side and a tumble of fruit on the other catches plenty of attention. Did we mention there's a Granny Smith apple green van? When your product focuses on a sense you can't express digitally, you have to cater to the others to compensate (and no, we're not talking about smell). A big focus for us was to make the "Full Summer Package" of delectible fruit visually tasty. Everyone loves a good advertisement. Flyers are the heart and soul of FTH's marketing game.